Recently it was announced it’s legal to hack your phone/devices. Today we look at why you would want to Jailbreak your iOS device. This will be a general overview of some of the capabilities and options available after a jailbreak. In a previous Article, Mysticgeek wrote about how to jailbreak your iOS device the easy way. If you are not yet on iOS 4.0.2 this method should still work. However if you have updated, you will need to wait for the new Jailbreakme.com to be completed. There are other ways to jailbreak your iOS device however, which we will discuss later. The apps, widgets and themes discussed maybe found using the Cydia shortcut that was added to your apps. Keep in mind that if you Jailbreak you Apple Device it may not be covered under warranty. However, you can easily set it back, so there seems to be some confusion on whether it will void the warranty or not if you set it back. 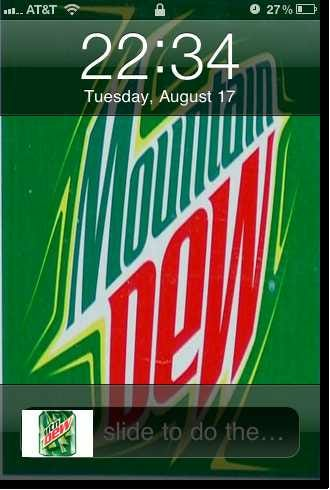 One reason that many people want to Jailbreak is to add information to their lockscreen. By default the iOS lockscreen shows you time and date, battery, life alarm status, Wi-Fi Status, carrier network status and notifications of events, SMS, or other popups from apps. The lockscreen widget we looked at in this test was LockInfo. LockInfo is free for a 14 day trial period and then costs 4.99. LockInfo has options for plugins and widgets in itself. 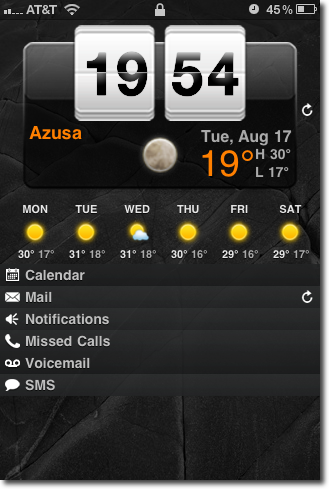 The plugin we tested was the HTC Plugin which aims to emulate the HTC Sense UI lock screen with its clock and local weather, as well as collapsible categories of pop ups such as calendar, mail, notifications (from other programs such as AIM or Facebook), missed calls, voicemail, and SMS. You can also add other plugins such as twitter and a mini web browser. 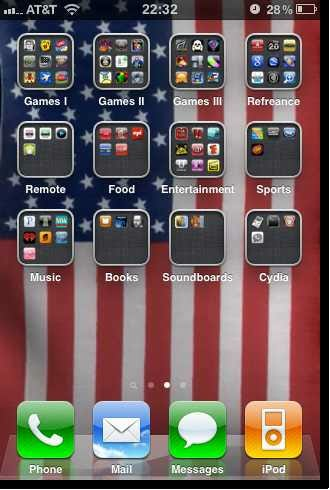 With iOS 4 you can now add a wallpaper to you home screens… ya… pretty exciting. The problem is that all of your icons and bars and text still look the same, and for some people, that’s boring. 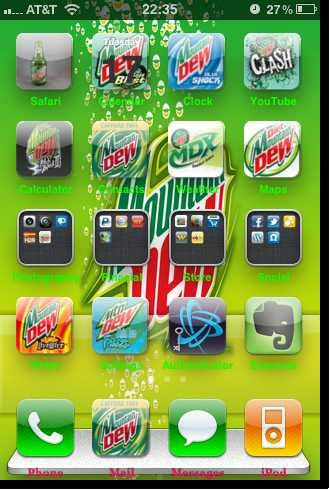 With Cydia you can install a theme app like WinterBoard. WinterBoard has taken over where SummerBoard was with older iPhones and the iPod Touch, it will support any themes created with SummerBoard as well as it’s own.. With WinterBoard you can select the theme element that you would like to change based on what you have downloaded from Cydia. There are many premade themes for the whole OS or just specific apps such as SMS. 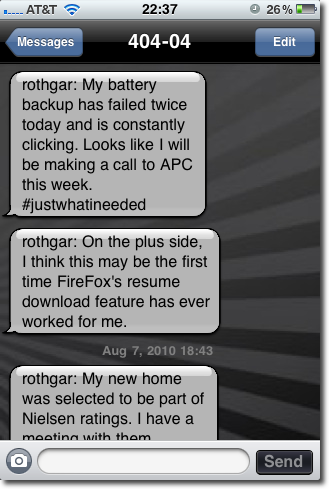 Another reason to jailbreak would be the option to use different and custom SMS sounds. By default you have six options plus the option of not having any sound. When you Jailbreak you now have the option to access /System/Library/Audio/UISounds which is where the audio files are kept. 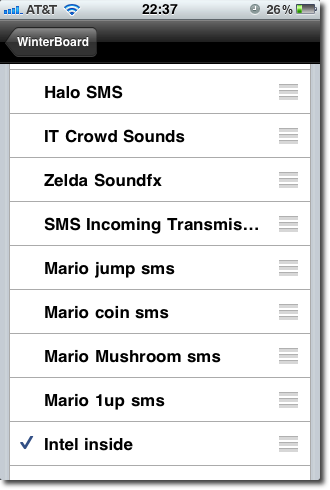 With Cydia you can download different SMS sounds and ringtones, to customize your iOS device. Most of the SMS sounds you download will be used with a theme application such as WinterBoard and will replace one of the default SMS sounds. A big feature that is added to a iOS device that has been jailbroken is apps do not need to be approved by Apple before appearing in Cydia for download. 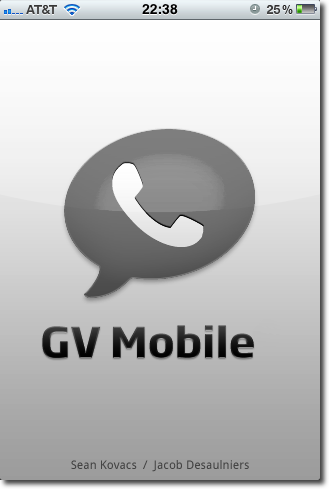 In this test run we discovered that there was a Google Voice app, GV Mobile. 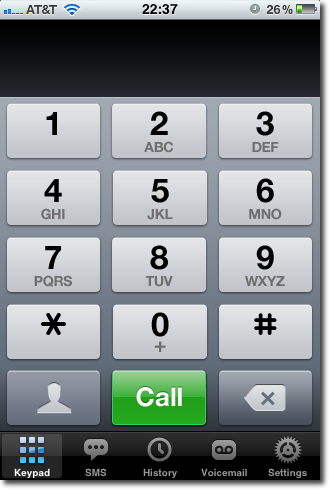 This app works with SMS and with calling, but calls by ringing the phone number that you set with in it for calls. There are more games, more text editors and more navigation apps available to you thought Cydia. There are more applications, tweaks and nifty things that can be done with OpenSSH and Cydia that we’ll cover in the future such as qtwitter, a Twitter app that will let you update your status from any window at anytime. You can add action menus and set other short cuts to access your apps faster. Lets face it, as geeks we love to make things our own. We’re dedicated to allowing you to own what ever geek piece of software or device that we can get our hands on. With the DMCA exemption that just passed some of those on the fence will now want to come to the side of freedom. But for those who don’t care about the rules and just want to hack every electronic toy you have, there are always new and easier ways to do this. We have only skimmed the surface of a few of the options that are now there. Here we took a look at some of the basic cool things you can do once you jailbreak your iPhone, iPod Touch, or iPad. In the future we’ll be taking a look at some of the more geeky tips and tricks you can do, so look for those soon. What is your take? Do you jailbreak your Apple devices right away, or are you on the fence about doing it. Leave a comment and let us know!